When 20 pounds of frozen halibut arrived at my door from my husband’s Alaskan fishing trip last week, what was a lucky girl to do?? Cook in frozen! The Alaska Seafood Marketing Institute has perfected techniques for cooking frozen fish that I think should be in everyone’s quick-meal repertoire. 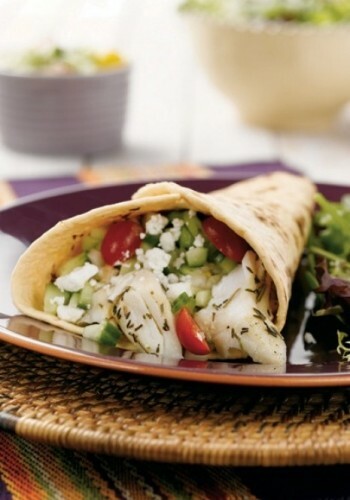 Continuing with my posts on published recipes, Halibut Tacos with Cucumber Salsa was my first pick from the Alaska Seafood website. Did I follow the recipe precisely? Not exactly. For the salsa I substituted celery for fennel, and feta for goat cheese, but I followed the technique for grilling frozen fish in foil, and it works beautifully. I’ve also used the frozen pan-searing method which works equally well. The website has short videos for six different methods including broiling, poaching, roasting and steaming. The magic of the cooking methods is covered heat to gently, yet quickly cook the fish in 15-20 minutes. It’s best if the fish is in portion sizes of 6-8 ounces and with uniform thickness, but I had good success with a 1 pound uneven piece too. 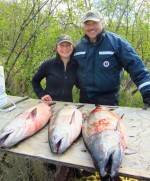 Bernie and our daughter Anna Lai with their salmon. Prep Time: 10 min. Cook Time: 15 min. Nutrients per serving: 498 calories, 23g total fat, 8g saturated fat, 41% calories from fat, 145mg cholesterol, 46g protein, 27g carbohydrate, 2g fiber, 507mg sodium, 303mg calcium, and 1140mg omega-3 fatty acids. You should invite me, I’ll help you cook it. I love fresh or/and frozen fresh Halibut. Salmon, I’ll eat raw! You are indeed one lucky girl! I love halibut and ate a ton of it years ago when I was visiting Alaska. I’ve never seen the cook it frozen site, so this was great information! Thanks so much for sharing. And these tacos look wonderful!! Perfect for the 4th! Yes, halibut is a nice fish to have plenty of! Glad you liked the cookitfrozen info. Love the idea of cooking frozen fish! These recipes should be added to Trader Joes magazine and the idea marketed on their shelves. Good idea — Trader Joe’s is where I’ve always bought frozen fish. I’ll suggest to Alaska Seafood to remind TJ’s! I have to depend on frozen fish! The only time I can count on getting fresh fish is on our Ontario fishing trip for walleye. Otherwise — frozen it has to be. I’ll be checking that site. Thanks! So nice to meet another Rosemary:), and your blog is beautiful! Let me know how you like the frozen methods. It’s a great time-saver and such a convenience to have ‘dinner in the freezer’.